Here’s an interesting little sequel to my last post,”Fossils and the wrong key”, in which I noted that stories of dinosaurs wandering into swamps, lakes, bogs, rivers, tar pits and so on abound, because dinosaur fossils and bones are found in sediments where they had to be buried rapidly. 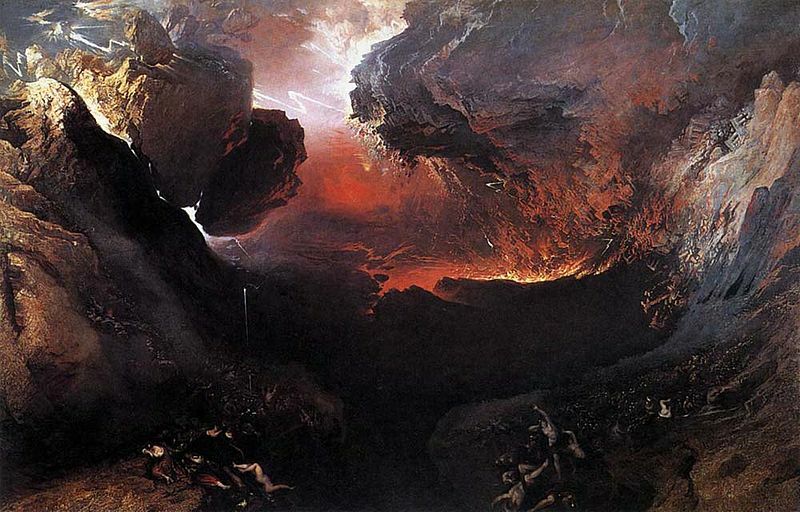 Evolutionists strictly enforce their “no divinity” rule and look for any other explanation than the Biblical one, which is that a world-wide flood rearranged the surface of the earth and killed almost all life. Frank Sherwin with Institute for Creation Research recently published an article* on a fossil find in Canada, which included a nodosaur in spectacular condition. Nodosaurs were tank-like dinosaurs, similar to ankylosaurs, covered with spiky scales. Miner Sawn Funk found one in 2011 in Alberta’s Millennium Mine, in such good condition that it looks like a statue. It even had skin remnants on its face and toe pads. How does that happen after 65+ million years? The sedimentary layers at the mine where the nodosaur was unearthed also contain plenty of plesiosaurs. How did creatures from land and sea environments get mixed together and buried in the same sediments? According to the official story, a flood filled a riverbed and swept the dead nodosaur out to sea. It sank to the sea floor and minerals quickly penetrated its skin and armor, “ensuring that the dead nodosaur would keep its true-to-life form as eons’ worth of rock piled atop it”. Or perhaps it got buried in the Biblical Flood, along with the plesiosaurs, all of which were swept together and buried in sediment-laden waters. 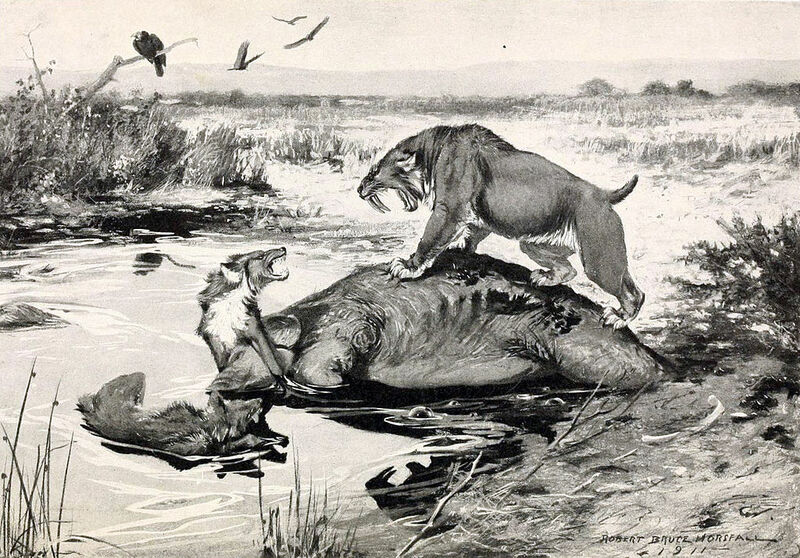 Whatever the reason given by evolutionists for their ultimate extinction, it’s fascinating to note that before becoming extinct the dinosaurs were in the habit of “falling into” swamps, bogs, lakes or tar pits…sometimes entire herds of them. Well alright, I’m not the first to notice this, and evolutionists have been hard at work trying to explain away the problem. Dinosaurs are often described as having “wandered around in swampy land”. In other words we “know” they lived in such places, because not only are many tracks found in ancient sediment (as are the tracks of many other animals), but dinosaur remains and their fossils are also found in ancient sediment. Think about tracks-if you make tracks in mud they will soon disappear: for tracks to be preserved they would have to be buried in more sediment. An animal has to be buried quickly to fossilize and not to rot on the surface or be eaten before it disappears. So for the evolutionist, it’s vital to conclude that they at least lived in the vicinity of a swamp or near a river, lake or sea where they might get buried quickly. Just imagine how deeply some of them had to be buried, considering how big they were, and sometimes there were several of them. “Fossils of dinosaurs are not common in Pennsylvania and are found only in Mesozoic-age rocks in the southeastern part of the state. Here, dinosaurs wandered near lakes and swamps, leaving tracks in the mud that later hardened to rock”. “In 1994, cement workers at the factory that bankrolls much of Sucre dynamited a hillside and revealed what is the world’s biggest collection of dinosaur tracks, bearing 5,000 prints of more than 250 individuals”…” Cal Orck’o is an awesome sight: a criss-crossing testimony to extinct herbivores and carnivores on their way to somewhere long disappeared; a flat, even newer America, from before the Andes formed. The Bolivia of the Cretaceous was a swampy landmass, home apparently to several species of dinosaur and a few primitive mammals. 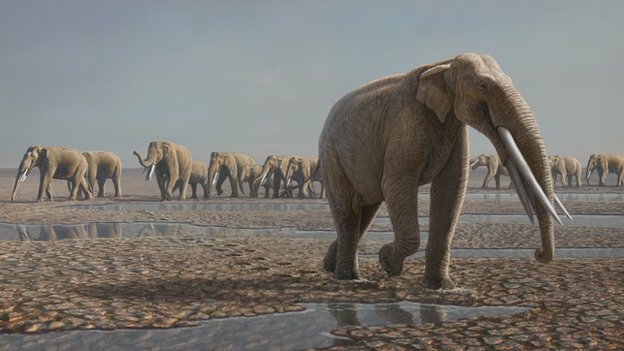 At least 8 different species of dinosaur have left their footprints in the clay bed of what was a dried out lake, including T-rex, Triceratops and Brontosaurus”. “These traps or bonebeds are unusual in that they consist of vertically stacked skeletons of numerous non-avian theropods in 1–2 m deep pits. The pits are filled with a mix of alluvial and volcanic mudstone and sandstone and appear to have been created by the trampling and wallowing of large dinosaurs. Small theropods and vertebrates then became mired in these pits, dying and being forced deeper by the activities of the large dinosaurs and the struggles of later victims. The high quality of preservation suggests a rapid burying of the carcasses”. You can research the evolutionist’s view of the habitats dinosaurs lived in: almost all involved water in the form of swamps, marshes, lakes and so forth. Even sand can form a new sedimentary rock when the grains are cemented together, and fossils can be found in sand and sandstone. There are also places in the world where “mass fossil graveyards” are found, where sometimes billions of different creatures are found buried together. Not only animals, but plants and trees are said to have been buried en masse by a sea moving inland, or by other local flooding, or by freak weather conditions (hardly “uniformitarian” conditions, eh?). “Scientists have revealed what may be the world’s largest dinosaur graveyard. The dinosaurs may have been part of a mass die-off resulting from a monster storm, comparable to today’s hurricanes, which struck what was then a coastal area. The findings could help solve a mystery concerning why the badlands of western Canada are so rich in dinosaur fossils.“ (You should take a look at the artist’s impression of this event). So here’s my point. The evolutionist, by definition, intentionally ignores any Biblical or supernatural explanation not only for the origin of life but also for Earth’s history. He’s not going to discuss the Biblical Flood, except perhaps to ridicule it and to make sure you don’t consider it to be a possibility. However, to me and to many others, including some scientists, the Biblical Flood beautifully explains the fossil record, the rock layers around the earth, and the subsequent ice age and runoff from the land causing world-wide erosional features. The Flood was not just a spell of rain gently falling from the sky until it was so deep everyone was swimming with nowhere to go: it was, as the Bible account describes, an event where even the earth’s crust would have been moving around, with associated tsunamis and turbidites, storms and volcanic activity on a huge scale. Flood legends survive from ancient cultures around the world, including the Gilgamesh Epic from the world’s first area of known civilization-Mesopotamia. But what about the ark? If specimens of every kind of animal went onto the ark to escape the cataclysm, there would also have been dinosaurs, right? This is often a subject of ridicule for the evolutionist-how could a huge dinosaur possibly have fitted onto the ark? Yes, dinosaurs may well have been on the ark, since babies and eggs could have been fitted on it no problem (see note 1). The surviving dinosaurs after the Flood would then have been targets of hungry humans, or people wishing to be rid of dangerous animals (as in the case of the wolf being driven to extinction in Britain in the middle-ages), or troubled by a changed climate now unfriendly to their habitat requirements. Hey-maybe they even sank into a swamp! All atheists believe dinosaurs died out millions and millions of years ago. But how come there are still dinosaur bones today? After millions of years they would have all decayed. There have been dinosaur bones found with living blood cells that still haven’t decayed. You would think that after millions of years the blood cells would not be there. But how did the dinosaurs die out? Creationists might say that after the flood they were hunted down and used for meat. On the atheists point of view they evolved into birds. Dinosaurs are cold blooded reptiles and birds are worm blooded. How can one type of animal turn into another? Atheists say that all those big dinosaurs could not fit on the ark. They are right. Big dinosaurs like brachiosaurus could not fit on the ark unless the ark was huge which would cause lots of problems for Noah. But if Noah took baby dinosaurs (most were the size of sheep) they could fit on the ark.